This story was updated at 9:55 a.m. EST. 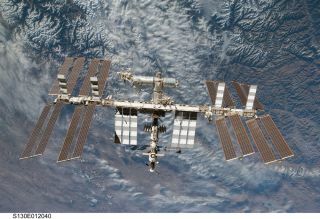 The Pope may make a special call to the International Space Station during the upcoming flight of the space shuttle Endeavour, according to a NASA official. NASA is discussing the potential call with the European Space Agency (ESA) and the Italian Space Agency (Agenzia Spaziale Italian or ASI), he said. "No final decision has been made – it is under discussion," Navias said. "We are discussing with ESA and ASI the potential of the pontiff calling the crew in a scheduled event slot that belongs to ESA. "Part of what will drive this, in whether or not it comes to fruition, is whether or not we launch on April 29, what the Pope's schedule looks like and whether there is any other opportunities if we launch later than the 29th." If Endeavour launches as scheduled next Friday, the call may occur on May 4, according to an Associated Press report, which cited the Vatican newspaper L'Osservatore Romano. European Space Agency astronaut Roberto Vittori, who has flown twice before to the space station, is one of the crewmembers of Endeavour's STS-134 mission, which is slated to launch from NASA's Kennedy Space Center in Florida on April 29. The satellite call will occur when Endeavour is docked to the orbiting outpost. Endeavour's STS-134 mission will be the orbiter's last before the shuttle is retired from service. The second Italian astronaut, Paolo Nespoli, has been living and working on the International Space Station since December. Nespoli launched to the station aboard a Russian Soyuz rocket. Nespoli is expected to return to Earth in September with two of his station crewmates, NASA astronaut Cady Coleman and Russian cosmonaut Dmitry Kondratyev. During the call, one of the astronauts will be carrying a silver medal that was donated by the Pope, according to the AP.